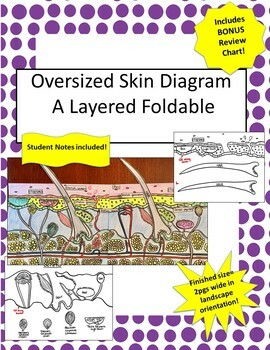 Oversized Skin Diagram FOLDABLE-Incl Student Notes,Glossary +Bonus Review Chart! Skin Diagram Foldable/Sketch Notes BUNDLE!- Great for Practice &Differentiation! 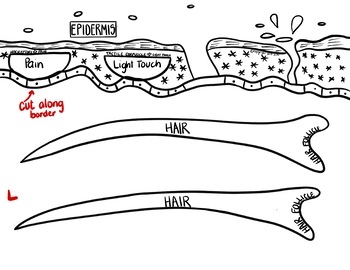 This resource includes all the information you will need to help your students understand & label the basic skin structures. 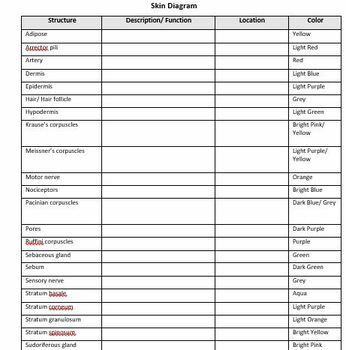 It also includes a Review Chart that helps students color code the structures, as well as my Student Notes and a Glossary of important skin terms. My students struggle because most anatomical diagrams are small and can be difficult for them to analyze. So, I decided to create oversized diagrams which focus on the important structures in an easy to interpret diagram. My students just LOVE these!! This resource includes an Oversized foldable printed over 6 pages. When completely finished, it is 2 pages wide (landscape orientation). It is awesome for instruction, lab, exams, or review! I also included the Review Chart my students use to color code their diagrams. It is a wonderful tool to help students review the structure, it's function, and location! 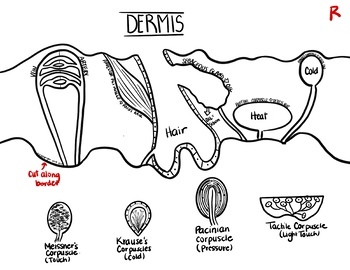 This resource even includes my student notes for the skin, as well as a glossary of important terms related to the skin. Perfect for differentiation in the classroom! Sketch Notes CELLS BUNDLE! W/Teacher's Guide & Student Notes! Includes 10! Sketch Notes GENETICS BUNDLE! W/Teacher's Guide & Student Notes! Includes 5! Sketch Notes BIOCHEMISTRY BUNDLE! W/Teacher's Guide & Student Notes! Includes 7! Comprehensive Genetics PBL UNIT!! Incl Sketch Notes,Teacher's Guide,PPTs,&Quiz! Pedigree PBL-The Blue People of KY Incl Sketch Notes,Teacher's Guide,PPT,& Quiz! I greatly value your feedback because it helps me determine which products are most valuable for your classroom so I can create more for you. If you have any concerns or any of my resources are not what you expected, please contact me first before leaving feedback so I can have a chance to fix it for you! You can email me at biologysketchnotes@gmail.com . Look for the green star next to my store logo and click FOLLOW ME to become a follower. Yay! You will now receive email updates about this store. Go to your My Purchases page (you may need to login). Beside each purchase you'll see a Provide Feedback button. Simply click it and you will be taken to a page where you can give a quick rating and leave a short comment for the product. Each time you give feedback, TPT gives you feedback credits that you use to lower the cost of your future purchases. Click on the Pin it button and pin it to one of your boards! © Copyright 2019 Dr. Shelley Montgomery. All rights reserved. Permission is granted to copy pages specifically designed for student or teacher use by the original purchaser or licensee. The reproduction of any other part of this product is strictly prohibited. Copying any part of this product and placing it on the Internet in any form (even a personal/classroom website) is strictly forbidden. Doing so makes it possible for an Internet search to make the document available on the Internet, free of charge, and is a violation of the Digital Millennium Copyright Act (DMCA).